Tekagi is one of the most respected and feared warriors of the Snakeroot/Hand ninja clan. Tekagi is a member of the Hand when Elektra first joins the group. Elektra at this time is attempting to mole into the group to take it down in order to impress her former master Stick. Tekagi suspects Elektra is duplicitous and tells her that if he is right about her she would receive no mercy. Later he watches Elektra bathe in a lake. Elektra knows he is there and attempts to rid herself of the suspicious thorn in her side. She telepathically commands other Hand ninjas to attack Tekagi. He kills them all. He powerful, and merciless fighting style greatly impresses Elektra and rather than fight him she makes love to him. The two later become bitter enemies. Tekagi becomes highly deformed due to being resurrected multiple times from the Sakki blade. 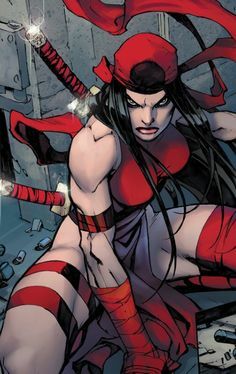 Tekagi is a character in the Daredevil story known as Fall from Grace. In this story he battles Daredevil with the Hand searching for a special telepathic virus known as About Face. He is the 2nd in command of Hand and follows the orders from Lord Daito. He along with Osaku help steal the body of SHIELD agent John Garrett in an attempt to find the About Face virus. The Hand takes a part of Elektra's essence that had been implanted in Elektra and created a proxy version of Elektra called Erynys. In doing so he faces off various heroes that includes Daredevil, Elektra, Shang Chi. When their plot fails, Lord Daito commits suicide out of shame and in so doing taints the demon possessed sword Sakki. It is through the demon blade that the hand gain their powers of resurrection. Tekagi then hatches a plan to restore the sword to its former powers. He believes by killing special innocent people that the blade can regain its evil charm. It sends forth teams of Hand members to kidnap a select group of innocent people. Tekagi is successful in killing one of the targeted people. However, Elektra stops him from killing the others. She kills him with the demon sword Sakki. His corrupted blood further reduces the swords powers. Tekagi also appears in the Root of Evil Storyline.